It's never been easier to explore the wonderful world of Japanese snacking. From all-black burgers to genre-bending vending machines, it’s tough to deny that Japan rules the snacking universe. Even the Kit-Kats are better. There’s so much to explore beyond the realm of Pocky and Kasugai Gummies, but it can be tough to track them down from abroad. Thankfully, a subscription service called Skoshbox wants to bring the genius of Japanese snacking right to your doorstep. You’ll receive a card in the box with a detailed breakdown of what snacks you have, as well as their ingredients—all in English, so you don’t have to worry if your Japanese is rusty (or nonexistent). 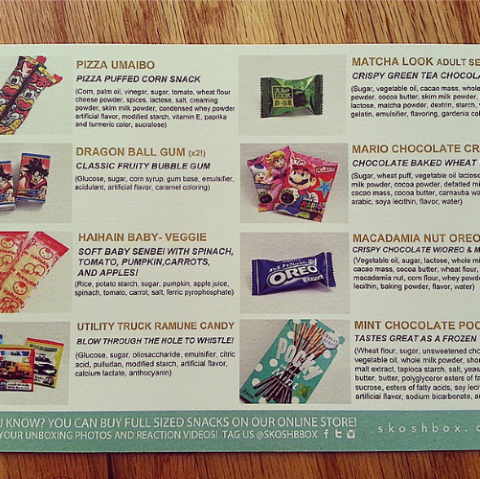 Since the snacks are imported by Skoshbox (which is based in the U.S.), the company says you don’t have to worry about customs fees or shipping delays. There’s even an email tracking service so you can keep tabs on each month’s shipment, which should arrive during first week of the month. If you really like what you received in your Skoshbox, you can buy individual snacks at the Skoshbox Shop. If you spend $25 or more, you get free USPS Priority Mail shipping. Some people have pointed out that you can pay a lot less if you just go to a Japanese grocery store and raid the snack aisle yourself. But that also assumes that you A) have a Japanese grocery store close by, and B) have time to go shopping. 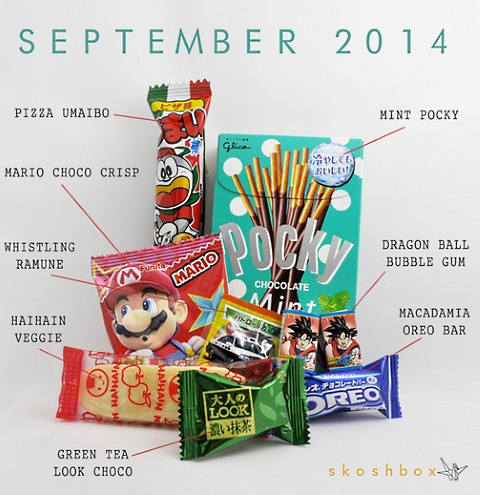 Skoshbox is basically like a personal shopper for Japanese snacks, and that’s why you pay a subscription fee. Plus, unless you’re fluent in Japanese, how are you going to push yourself outside your comfort zone and try new snacks? You probably won’t love everything in every box, but that’s what the office break room is for.